Posted March 29, 2006 in 2006/03, 3 Timely, Assorted, Harvey Covers, Periods, Topic, z Archive. The original art for this cover still exists. 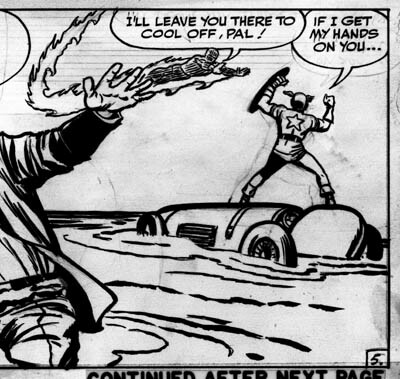 The inking was just marvelous, but unfortunately much of its quality was lost when printing the small sized cover. So here is a scan from the art. 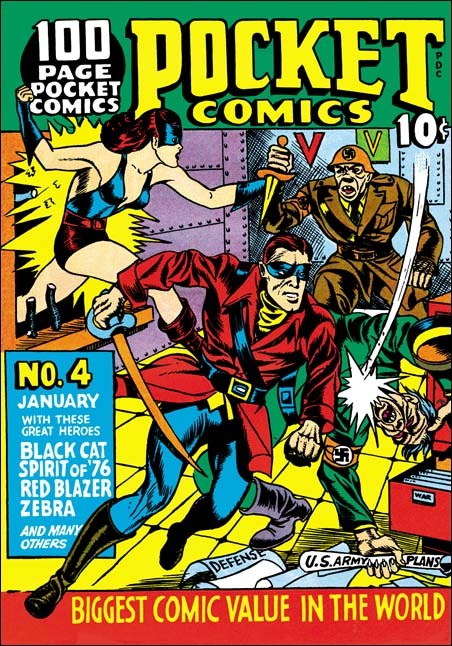 Pocket Comics #4 has a cover date of January 1942. 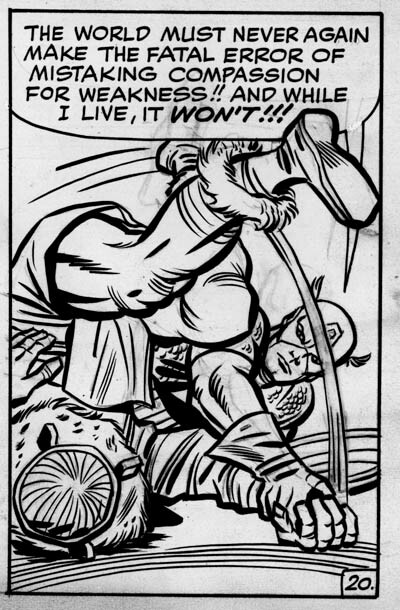 This is the same month that the last Simon and Kirby Captain America came out. Coincidentally this was the last month that Harvey would publish pocket size comics. 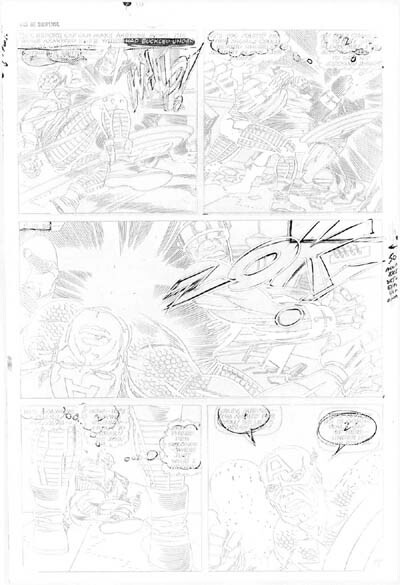 The next time Simon and Kirby work would reach the racks it would be dated April. Posted March 26, 2006 in 2006/03, Artists, Simon, Joe, z Archive. 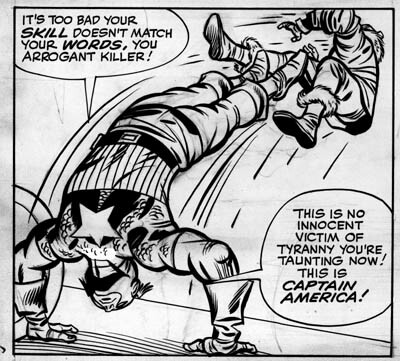 Joe Simon relates a story that once when he was in a legal battle with Marvel over copyrights, a threat was made to kill off Captain America. 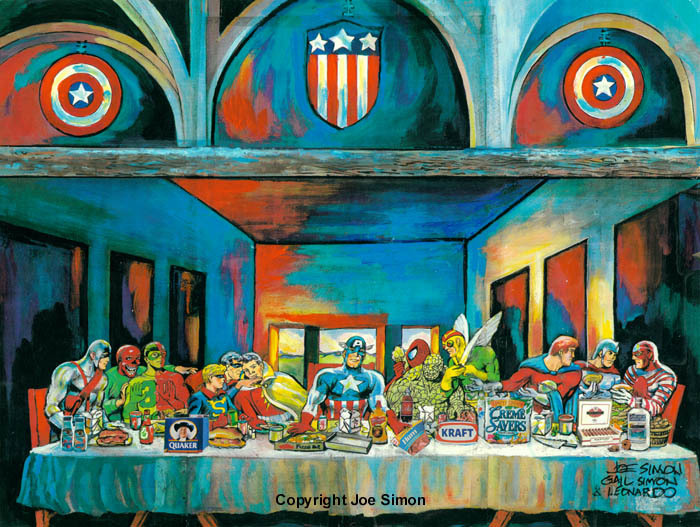 Joe then proceeded to make a painting of Captain America’s last meal with help from his daughter Gail Simon and someone named Leonardo. The painting has a prominent place on his living room wall. You can see a larger version of the image here. Posted March 25, 2006 in 2006/03, 6 Mainline, 7 Freelance, Featured Work, In Love, Periods, Prize, Topic, z Archive. 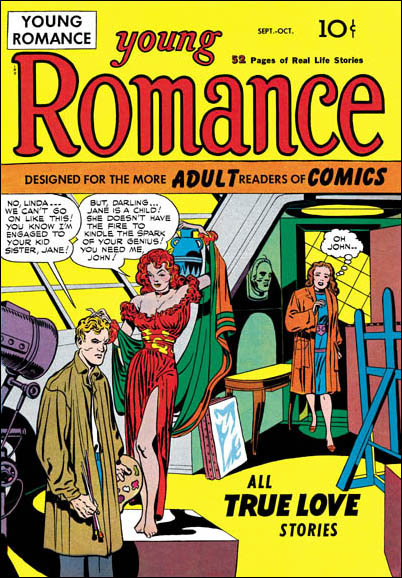 But for a short time Joe and Jack had their own publishing company Mainline with a romance title In Love. 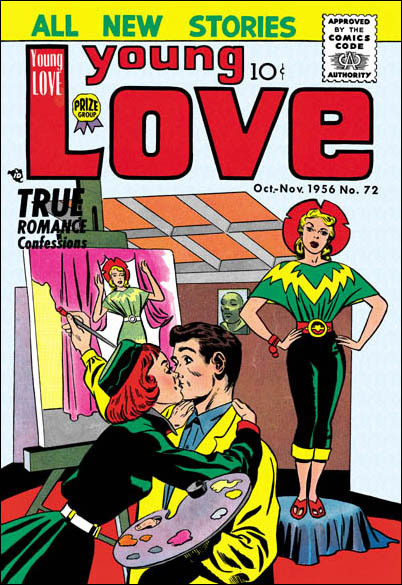 The third issue of In Love had, surprise, surprise, an artist/model theme cover. In fact the contents was a story about a comic book artist and model. I ask Joe about it once and he commented that they always like that theme. 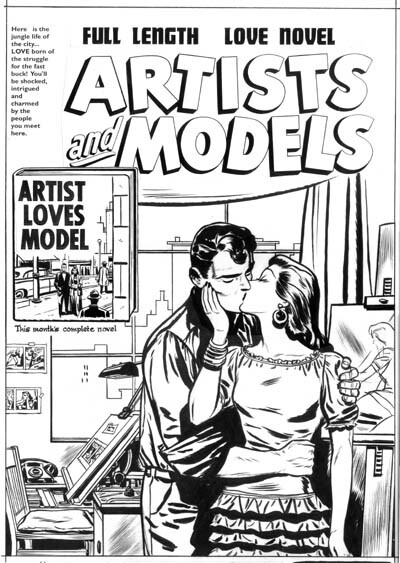 Apparently they liked the idea so much that made a proposal for a comic book or oneshot called “Artist and Model”. 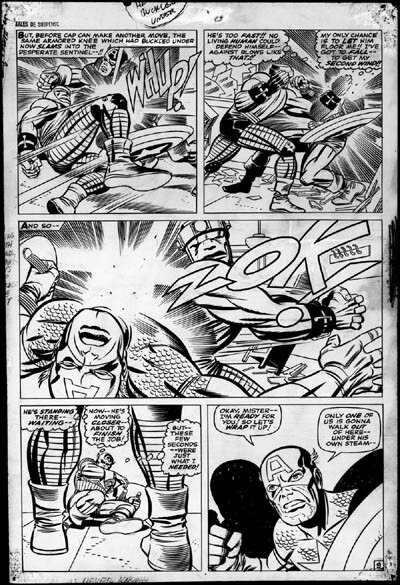 Two covers were made for that proposal, one by Kirby and the other by Bill Draut. 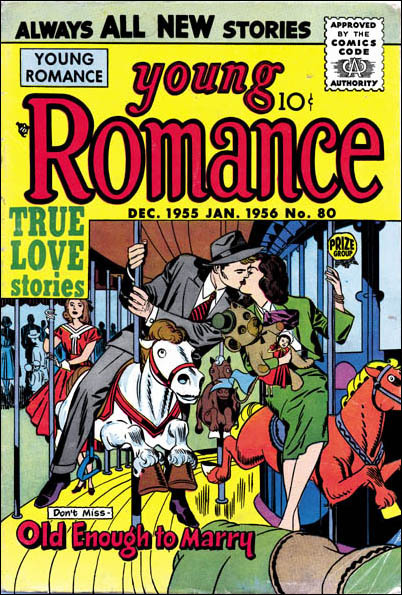 Jack’s cover was used for the In Love #3 but Draut’s was never published. Posted March 23, 2006 in 2006/03, 3 Timely, Assorted, Harvey Covers, Periods, Topic, z Archive. In Pocket Comics #1 the title has been reduced compared to #1 so there is more room for the art. The main scene once again depicts an oversized attaching Satan, being ineffectively fought by a miniature military (in this case some of battleships) with an giant Spirit of ’76 coming to the rescue. On the left side of the cover is the Black Cat, seemingly not part of the scene with Satan, but oversized nonetheless. 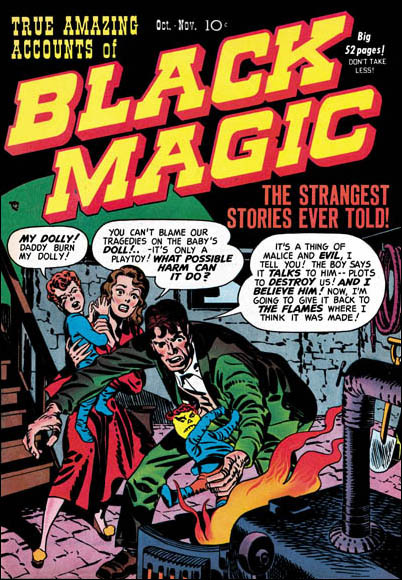 The Black Cat started in Pocket #1 just a month before, so her presence on the cover is too soon to be due to an unexpected popularity. 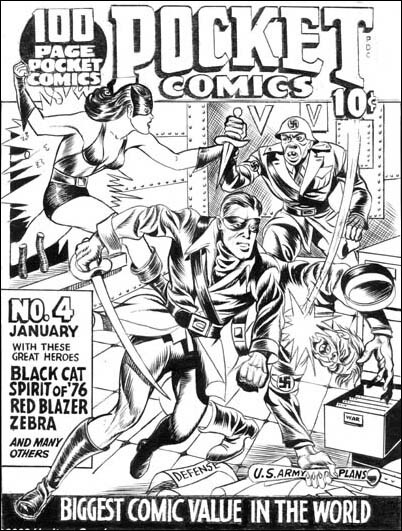 Rather having depicted Satan and the Spirit of ’76, the Black Cat seemed more unique since the other features were the standard male heroes. 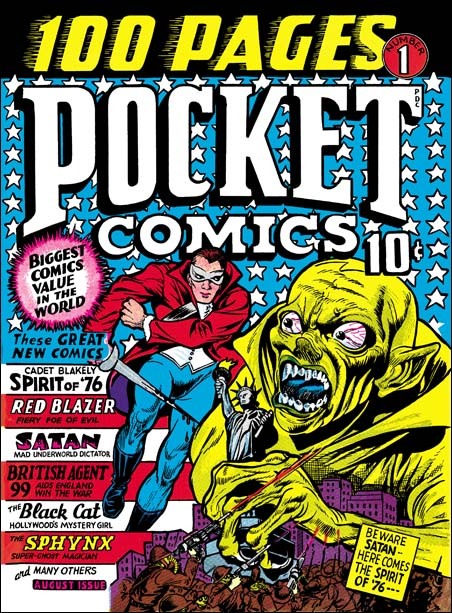 The similarity of design and execution of the Satan and Spirit of ’76 scene with that depicted on Pocket #1 leaves little doubt that this was also done by Joe Simon. Further the execution of the Black Cat matches the rest, so Joe did all of the cover. Posted March 20, 2006 in 1 Early, 2 Fox, 2006/03, 3 Timely, Assorted, Harvey Covers, Periods, Topic, z Archive. 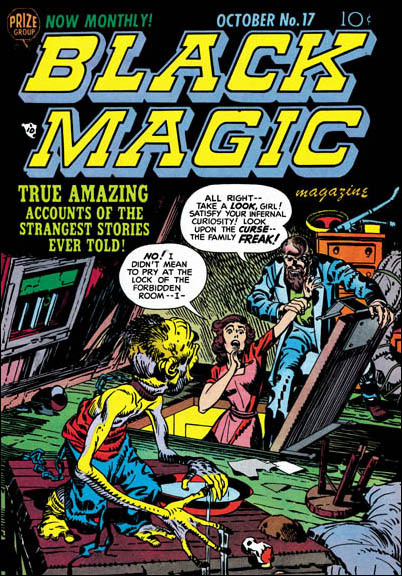 In his book “The Comic Book Makers” Joe Simon describes how his friend Al Harvey approached him to do a cover for Al’s new concept, a small sized comic book. Joe also tells how Harvey offered to make Joe a partner for $250. But Joe was then working on Captain America. 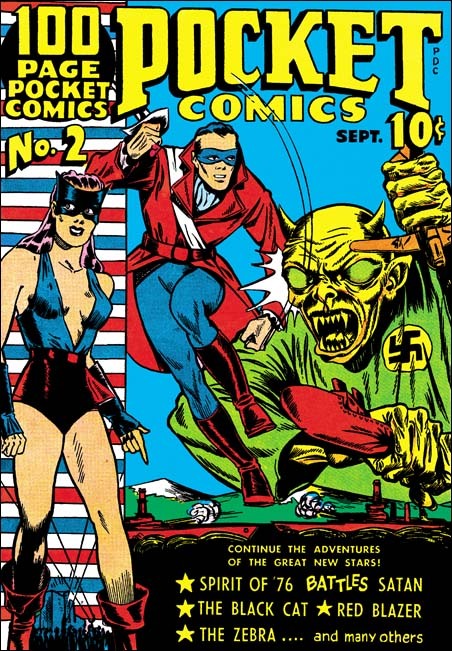 At Timely he and Jack Kirby were supposed to get a share of the profits for this very popular comic. So Joe felt the safe thing decision was to stay at Timely and so turned Al down. It probably seemed at the time like a no brainer, but Simon would never saw much royalty money from Timely and would leave before the year was out. As for Harvey his new comic book concept would not last long but he still managed to build up a very successful comic publishing business. There are things about this cover which I find unfortunate. The field of stars gives me a claustrophobic feeling. But the biggest problem may not have been Joe’s fault as he said he was working from a mock-up. 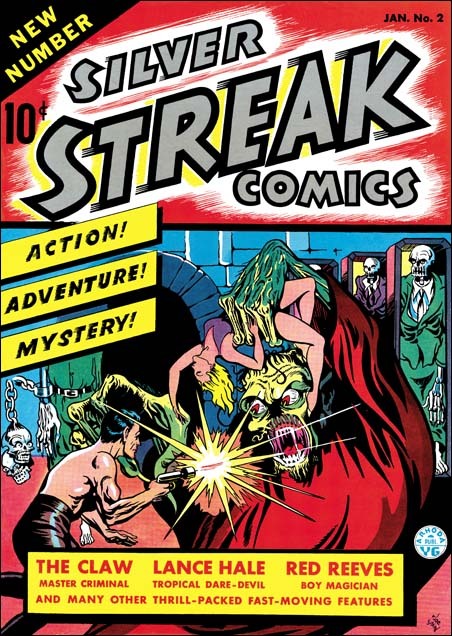 Nearly half the top is occuppied by the comic’s title. If that was not enough the left side has a list of the comic’s contents. This left little room for Joe to work, but he uses it well. Joe came up with a terrific design and he executed it well. The scene portrayed actually is not logical, but it works. On the cover Simon provides a Satan that is a bit differant then that in the comic itself. This is not just due to the colorist’s use of yellow instead of the classic red. 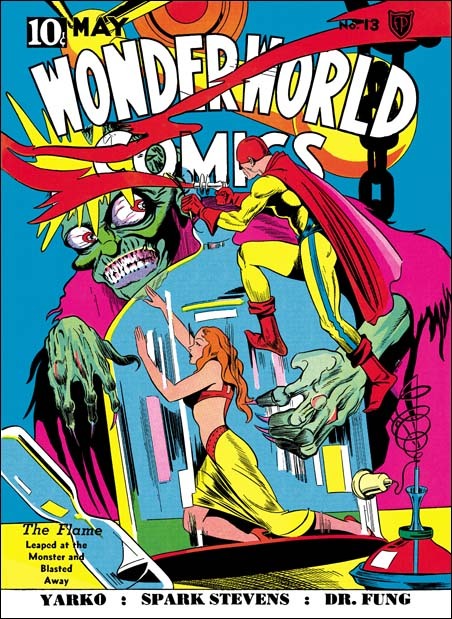 Instead Joe has turned to a cover he did for Fox, Wonderworld #13 (May 1940). 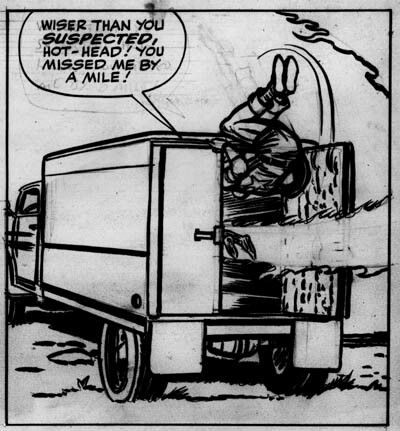 For the Fox cover, Joe was trying to work in the style of Lou Fine. 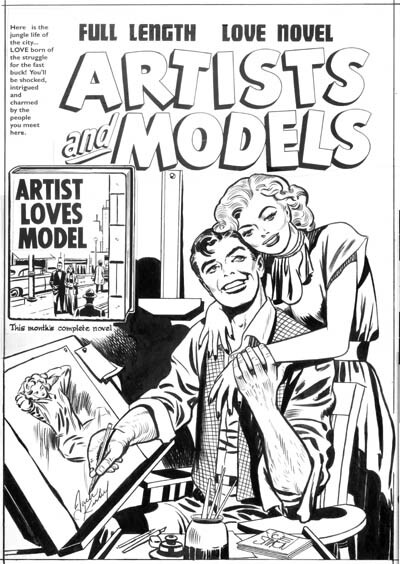 His success is shown by the fact that that cover was often attributed to Lou despite the presence of a Joe Simon signature.